Fifty years ago, two machines began stories that would rewrite history; one on the race track and one in the air. Those machines have now been brought together to celebrate the anniversary of when they changed the automotive and aerospace worlds. 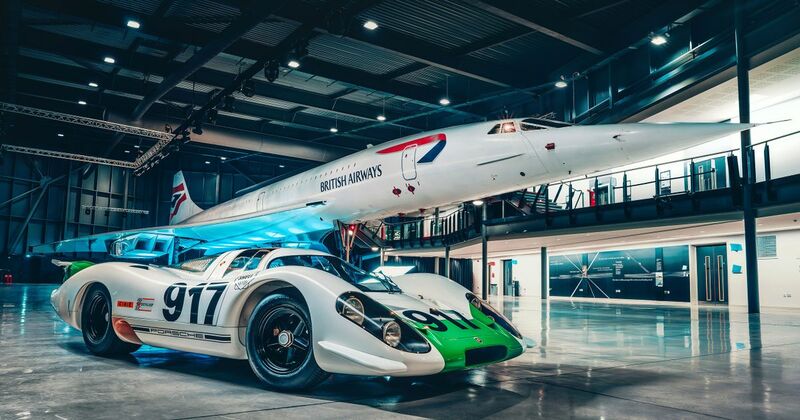 Porsche 917 chassis 001, externally restored to stunning condition, began its development in the same month that Concorde 002, the first made in Britain, took its maiden flight from Bristol’s now-defunct Filton Airfield. Now the two have been pictured together in what can only be described as the most desktop wallpaper-worthy pairing of the year so far. The 917 was taken to the Fleet Air Arm Museum in the small town of Yeovilton, near Yeovil in southern England, where Concorde 002 now rests. 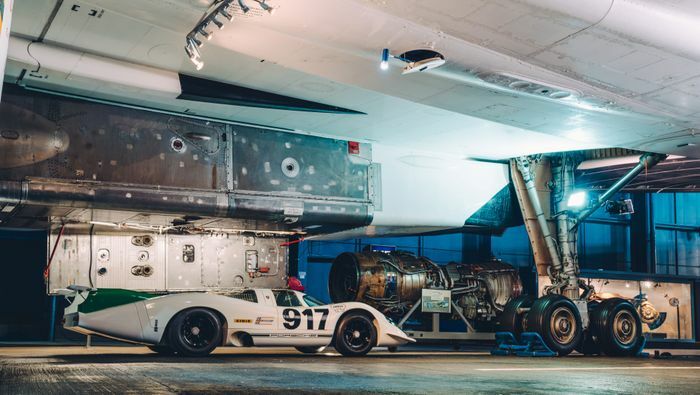 The legendary plane, officially the second prototype after the French-built Concorde 001, has been grounded since 1976, flying for seven years in order to keep testing components. 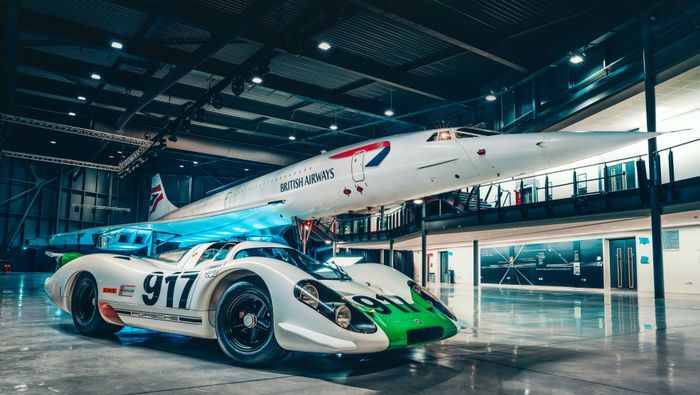 Its Porsche counterpart recently completed a full tour of the UK following its restoration. The two stars of this photoshoot are forever linked as products of the same envelope-pushing era. They used aerodynamics in new and exciting ways to achieve higher speeds than ever. The 917 destroyed all competition before it throughout the 1970s, while there has never been another commercial airliner like Concorde. There may never be again. There are many differences, of course. 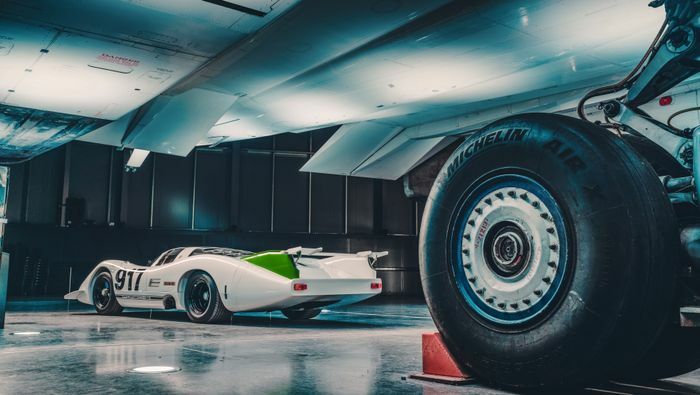 The 917 was built to be lightweight around a spaceframe chassis that weighed just 42kg. Concorde was 78.7 tonnes at empty. Both are iconic and beautiful examples of what the late 1960s, a time of great imagination and growth, could deliver. Enjoy these pictures and remember what awesome machines they were.